1. A few days before taking off for North Carolina I took my car in for a safety inspection to make sure it could make the trip. And found out that it was iffy and would take several thousands of dollars in reapir to guarantee it could. In the absence of that much money and in light of the fact we were planning on getting a bigger vehicle in the next year, we decided to go ahead and buy a new car. I was devastated. And an emotional mess for a few days. This car was only short a color and upgraded engine from being my absolute dream car. I knew I couldn't keep it forever, but was anticipating having more time to say goodbye than I did. I still miss it today (and get teary eyed looking at the picture I took of it). 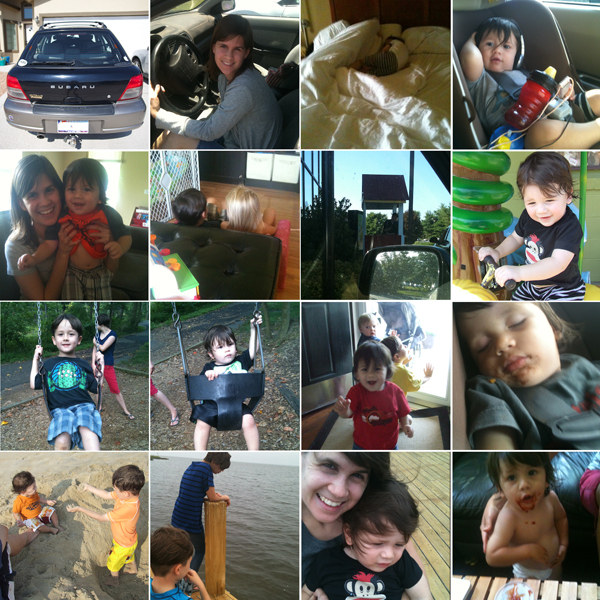 My new car (a 2009 Subaru Tribeca) is awesome and perfect for our family, but this little wagon and I were one. I could whip it around and in and out of everything. The Tribeca, not so much. But sometimes you have to make sacrifices for the family, and this was one of mine. 2. My last moments in my car. I had Rob snap this picture, then proceeded to sob into his back as he scraped my DOD sticker off the windshield. 4. I got blessed with awesome travelers!! 5. So happy to be in NC visiting friends!! 6. It was so sweet to see these two heads together again. They were baby friends, and had no issues picking up right where they had left off. 7. As it often goes with road trips, we hit up a lot of drive throughs. But this one takes the cake! (yes, that is a person in a booth in the drive-thru lane. I think I made him uncomfortable with all my staring. 8. We went to the petting zoo while visiting my grandparents in northern VA. Of course the quarter carousel was the most popular thing with this one. 9. Swinging at the same playground my mom did growing up, and that I did as a kid visiting my grandparents. 10. Someone not too sure how he felt about swings. 12. Sleeping in the car. The boys did a lot of that this trip. 13. We WENT TO THE BEACH!!!!! 14. And checked out the sound. 15. Nick and I, posing in the crazy wind. 16. Someone LOVES marinara sauce! 1. Rob finally arrived in NC too. We spent some time just chilling at my parents house in between all the craziness that had to get done. 3. Having fun in the car while the truck gets loaded up. 4. We made sire to stock up on Cheerwine since we don't have it here in Texas. 5. Being silly on a food break on the drive back to El Paso. 6. The Samurai managed to land in the rocks during the unloading process. It was quite entertaining watching this whole process of getting it stuck, then unstuck. 7. Avoiding unpacking as much as possible. 8. 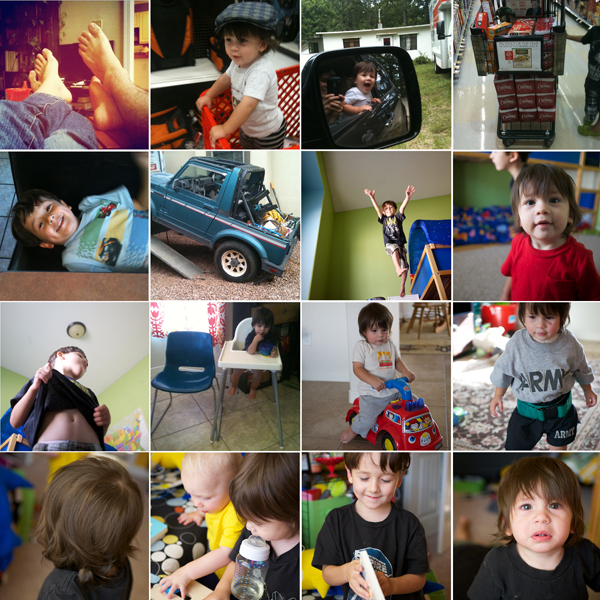 No matter what, this kid will stop and look at me when I have the camera out. It's amazing. 10. Nick using his little brain to solve problems. He pushed the chair into place so he could get in his hight chair and have a snack. 12. Trying on his little buddy's PT's! 13. I LOVE HIS HAIR!!!!!! 15. Max showing off the dimples. Next up, September and October!